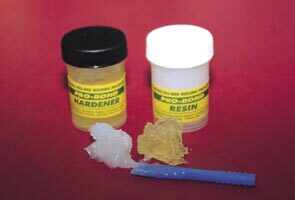 Mix two equal parts of ProBond Resin and Hardener to form an even mix. This is what your mix should look like, always mix enough to make sure you don’t run out halfway through. 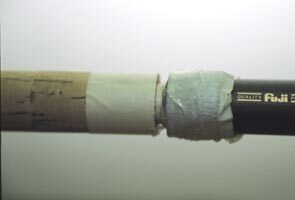 Apply the adhesive liberally to the Rod Blank, being careful to tape up Cork Grip and Tube Fitting to stop contamination. 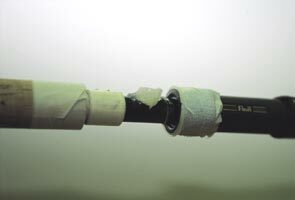 Then start to slowly turn your Reel Fitting into position.To ensure a reel fitting has a tight fit onto the blank, build up the blank with masking tape. 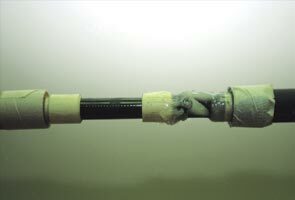 When you get halfway, spread more of your resin mix onto the rod, carrying on twisting the fitting into position. 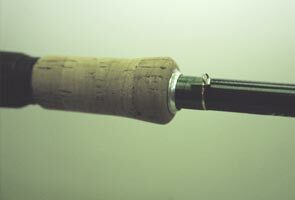 Just before you get to the end, clean out any build-up of resin mixture, to prevent spoiling on the Cork Grip as you twist the Reel Fitting into its final position. Fitting the Cork Handle is done in the same way as fitting the Reel Seat. 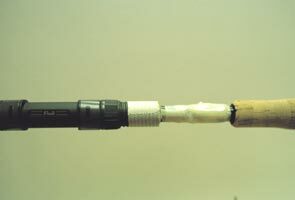 Tape the blank with masking tape until you have a snug fit, not too tight or too loose. Spread resin onto tape, ensuring complete coverage all the way round and place some inside the Cork. Twist on and push into position. Finish off with a neat shiny winding check to make the end product so much better. Whilst doing this you can whip on a Hook Keeper to complete a first class end section. 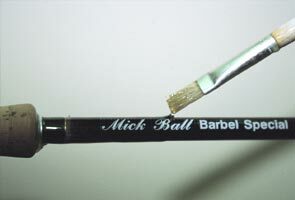 Place on your transfer or signwrite your name with white enamel paint. Mix a good amount of ProBuild gloss finish and using a stiff brush spread evenly along the length of the graphics to give a durable finish. 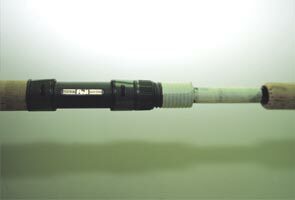 This is a selection of all the items you will need to build and finish your own custom built fishing rod. And all supplied by Hopkins & Holloway.